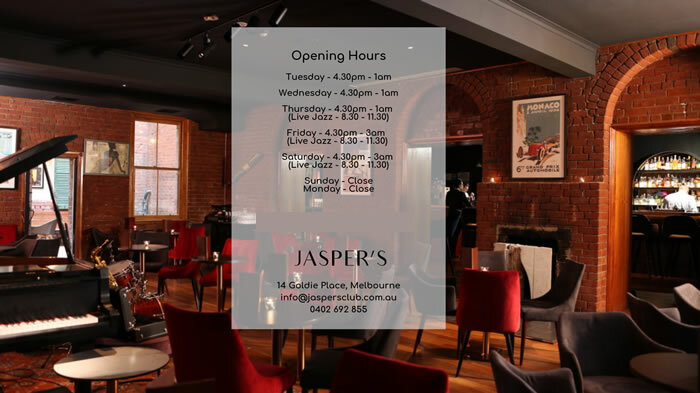 Jasper's Jazz Club is cool Jazz bar and performance space in the heart of the CBD. This new, sharp bar & jazz club at 14 Goldie Place is simply the best in Australia! From the moment you walk in, you'll be taken back to the sleek, sassy, 'Speak Easy' era of the 20s & 30s, where style, class and discernment prevailed! The bar staff are super welcoming & attentive to your 'whisk me away, help me relax & smile' needs. Plus, the brilliant bands are of the highest jazzy, swingin' & bluesy calibre you'll ever hear!